It will not come as a surprise when you consider how crucial ‘engagement’ is – whether you have been a monitor of your class, a teacher handling multiple students during tuition sessions, a manager handling a team, a policeman patrolling an area, or a businessperson. Just like a team game, business success stories heavily depend on engagement – with businesses as well customers comprising a team. No amount of one-sided effort can take a business to success and wealth. In fact, minus the customers, a business will cease to exist. However, most businesses do not know how to be connected and engaged to their customers. This limits their understanding of actions needed to improve and puts to risk their future prospects. The result is that they lose out to a smart competitor, who is always on a look-out for such an opportunity. The question now arises, ‘How do we keep customers satisfied and Loyal to you ?’; and the answer is simpler than you thought. The three steps which are self-explanatory are – understand, connect and engage. While ‘understanding’ deals with an insight into consumers’ needs and wants,‘connecting’ basically signifies being able to reach out to your customers through online and offline media.Then comes ‘engagement’, wherein you interact and provide support and solutions to customers at various stages of purchase, use and refresh cycles of your product/service. 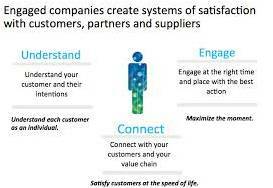 How do you achieve this with your customers? To assist you in connecting, understanding and engaging with your customers, Glad Minds has created a new cloud-based customer communication platform. Besides a host of features, it will enable you to connect and engage with your customers directly. This process will give you the right ammunition to grow your business.